The Milken Annual Fund is a fundraising priority of the school that we budget for and depend upon. Your donations account for 12% of Milken’s annual operating revenue. Tuition and a strong Annual Fund enables Milken to deliver the school’s rich and innovative programs. 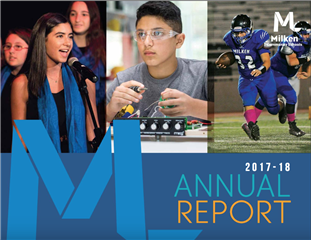 At the start of each school year, Milken asks you to participate with your tax-deductible donation to the Annual Fund. The funds raised immediately benefit your child in the current school year. Milken depends on your partnership to help the school deliver our mission to our students. Participation in Milken’s Annual Fund is an expected component of the parent-school partnership. Milken cannot be successful without you! Our goal is 100% participation. As long as you’re contributing to the best of your family’s ability, your gift is deeply valued and underscores the investment you have made in the education of your child. Strong parent support demonstrates to the community your confidence in Milken’s mission. High participation opens doors to financial support from foundations and organizations because it confirms that Milken parents are vested in the school. We ask senior families to make an especially meaningful contribution in celebration of their graduates and to show appreciation for the committed faculty members who inspired, taught, and guided their students. Milken’s campaign is underway. We ask that you make your tax-deductible gift or pledge by June 30, 2019. Prompt response to this request will be greatly appreciated. Parents who have not participated will receive regular reminders throughout the year from our Annual Fund Parent Volunteers and the Advancement Office. Once your family participates, you will no longer receive solicitation calls, letters, or emails. You have the option of making your donation in one payment, semiannually, quarterly, or monthly. You may make a secure credit card donation online. Honor the past, support the present, and celebrate the future.